Even while squandering multiple chances, Chelsea managed to seize a point from the widely anticipated clash with Arsenal, which ended 2-2. Both teams, desperate for a better spot on the table, faced each other with maximum tenacity. Whilst conceding the fact that almost every player on the pitch played his part well, one particular Chelsea man stood out the whole match. Alvaro Morata, a summer signing, was expected to fill the gap left behind by Diego Costa since his arrival. However, despite bagging quite a number of goals, the former Real Madrid star has failed to display consistency throughout. With a low conversion rate, the 25-year-old is proving to be a poor replacement for Costa. Amidst the match with the Gunners, the ex-Juve attacker dissipated a few crucial chances, which could’ve sealed the Blues a victory had he converted. The one-on-one against Petr Cech in the former half happened to be the most disappointing one among all. Furthermore, the pacy attacker left the crowd stunned when he missed another one-on-one a while after Bellerin’s injury time equaliser. Moreover, it was his touch that aided the opposition to score the opener, with Jack Wilshere making the most out of it. 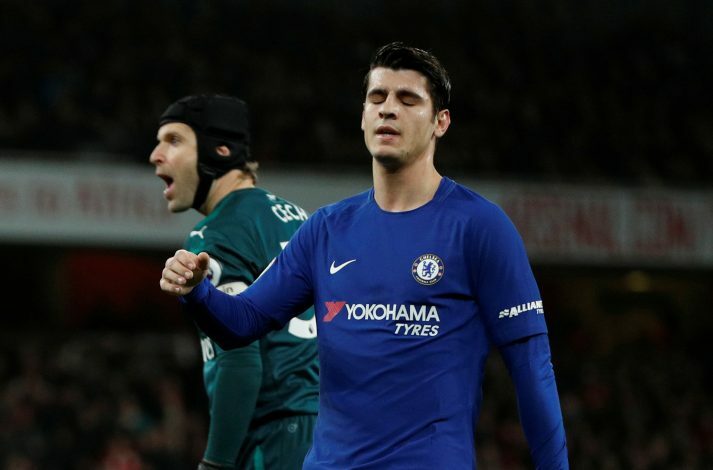 Numerous Chelsea fans are now sceptical regarding Morata’s future, and a few even doubt whether he’ll ever be good enough to lead the pack from up front. Diego Costa watched Alvaro Morata bottle those chance then he forward Conte the text message Conte sent him with a laugh emoji. Morata is awful he missed 3 Clear Chances against stoke & easily walks into the XI. If someone wants to stone you just shout "Morata" that stone will miss you. Regardless, with the winter transfer window being open at the moment, supporters might witness Antonio Conte turning things around by roping in another classy forward, as the current circumstances demand so.